Google Allo has got a new function to turn selfies into emoji / stickers. With the feature, available for Android, you can create custom stickers based on your photos and share them with your friends in messenger conversations. The app uses the front camera of the smartphone to analyze your face and create an animated character - quite similar to Snapchat 's BitMoji. In this step-by-step guide we will show you how to create stickers with your photos in the Google app. Step 1. Open a conversation with your friend on Google Allo and click on the "+" button. Then press the "Add Stickers" button. Step 2. Select the option "Transform a selfie into sticker / emoji". On the next screen, tap Create. Step 3. The application will open the front camera of your phone so that you can take a picture. (Tip: For best results, look for places with good lighting and also with a neutral background from which you can stand out). Step 4. The application will process your selfie and display a package inspired by photography. There are three options: Redo (to capture another image), Customize character, or Save. We will follow this tutorial with the editing function. Step 5. The first step in editing is to choose the face shape: you can choose between "short" or "long" heads. Step 6. The other editing options are, respectively: hair, eyes and eyebrows, mouth and nose, beard and facial details. When done, tap "Save". Step 7. 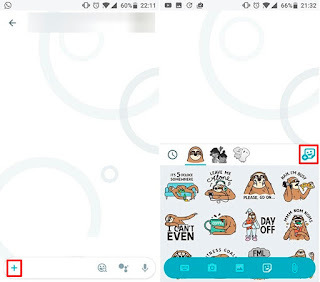 The stickers will appear on a separate flap on Allo's conversation screen. Just touch them to send. Now you already know how to create stickers using selfies on Google Allo. If your messaging app is up-to-date but still does not display the addressed feature, there is a possible fix for this problem. Just open Android settings, select the application option and search for Google Allo. Then clear the app's cache. Finally, just close the program in the list of recent Google apps. If the stickers feature still doesn’t show up on your phone, it may not yet be available for your account.